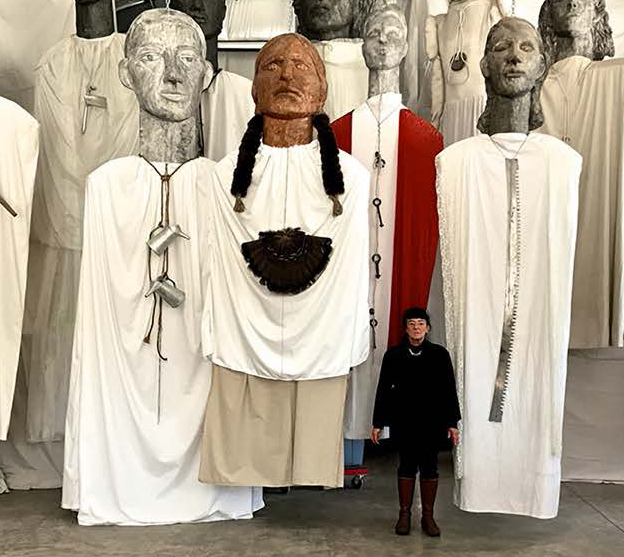 Deborah Masters’ Spirits, whose heads measure up to five feet in height, are clothed in white, robe-like garments, and wear talismans signifying their identities. Suspended from the ceiling by chains, they stare out at us impassively, silently dwelling in their own consciousness. The Little Spirits, both human and animal, have a quirky individuality and engaging liveliness. 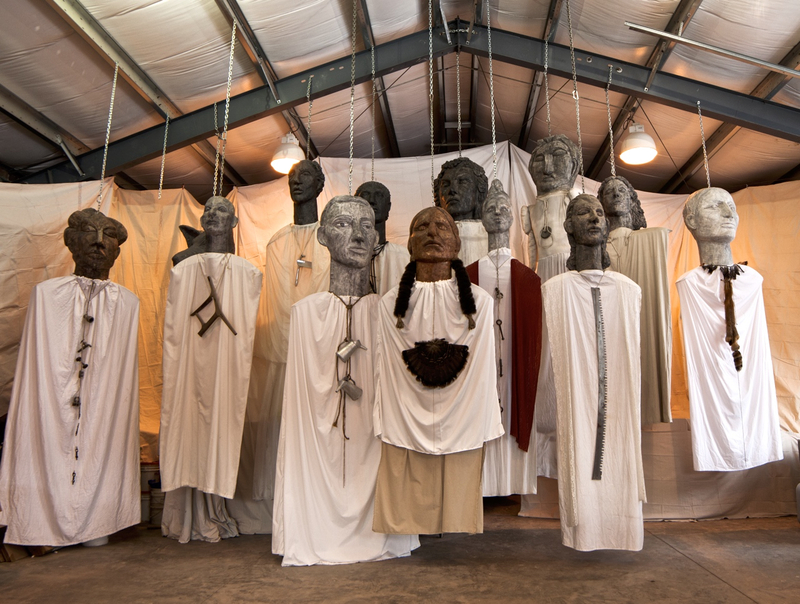 Their heads are in white porcelain and in clay glazed in many colors, and they wear sheath-like garments. They are drawn from people, dogs, and cows known by Masters through her life. In her drawings, the artist renders her figures, both real and archetypal, with graphic energy and directness. We witness her confronting the observable and translating it into the hieratic presences that we see in her sculptural work. For the past three decades, Masters has been creating a series of Crosses, which are like diary entries that capture the inner concerns of the artist. The painted images range from Christian iconography to reflections on tsunamis and the refugee crisis, to the landscape of Central Pennsylvania where the artist grew up. The Crosses, like all of Masters’ work, join the human and the spiritual, asking us to see them as one. The exhibition was organized through Katharine T. Carter & Associates. Deborah Masters was born in Harrisburg, PA in 1951. Her Greek father died right before she was born. Until age seven she lived mostly in New Mexico and Mexico with her mother and grandfather, where she was exposed to Native American culture, Mexican art and traditional altars, and to the many artists who lived in Taos, New Mexico. After moving back to Pennsylvania, Masters became deeply involved in art making. Her mother frequently took her to the major museums in New York City, and it was not uncommon for her stepfather to leave her at the Philadelphia Museum of Art during his business hours. She attended Bryn Mawr College, where she initially focused on Medieval art history, particularly the early Italian painters and sculptors, earning a BFA in 1973. She concentrated on sculpture and bronze casting at Haverford College and did a three-year stint at The New York Studio School. Since the 1990s, public and private commissions brought Masters’ work to a wider audience. Notable public projects include Walking New York, 350 feet of painted reliefs at John F. Kennedy Airport Terminal Four, Immigration Hall, and the 1260 square foot, Coney Island Reliefs, for the Metropolitan Transit Authority in Brooklyn. Other installations include the Whitney Museum at Phillip Morris, New York; Three Sisters, at CSU Chico, In California; and Audubon Park, New Orleans. Masters has had solo exhibitions at Storm King Art Center, New Windsor, NY; LedisFlam Gallery, New York; Long Island University, Brooklyn; and Smack Mellon Gallery, Brooklyn, NY. For over 30 years, her work outside the studio has reflected her social consciousness and concerns for the environment, and she has received awards and recognition in these leadership roles in Brooklyn, Greenpoint, Williamsburg, and Upstate New York.